Sit facing the cable row machine and place your feet on the foot rests. Grasp the double-row bar and slide your bottom backward until your knees are almost straight. You torso should be leaning forward and your arms and shoulders should be stretching forward. Exhale as you slowly lean backward, straighten your back, and pull the v-bar to your abdomen, keeping your elbows close to your body. Pull your shoulders back and stick out your chest at the top of the movement. Inhale as you slowly lean forward and return the double-row bar to the starting position, with your arms and shoulders stretching forward and your lower back bent forward. Do not excessively arch your back. Avoid swinging your torso back and forth. Start light and add weight gradually to allow your lower back time to adapt. Many people think that your biceps acts as a synergist in rowing exercises such as the seated cable row. In fact, it only acts as a dynamic stabilizer, along with the long head of your triceps brachii. 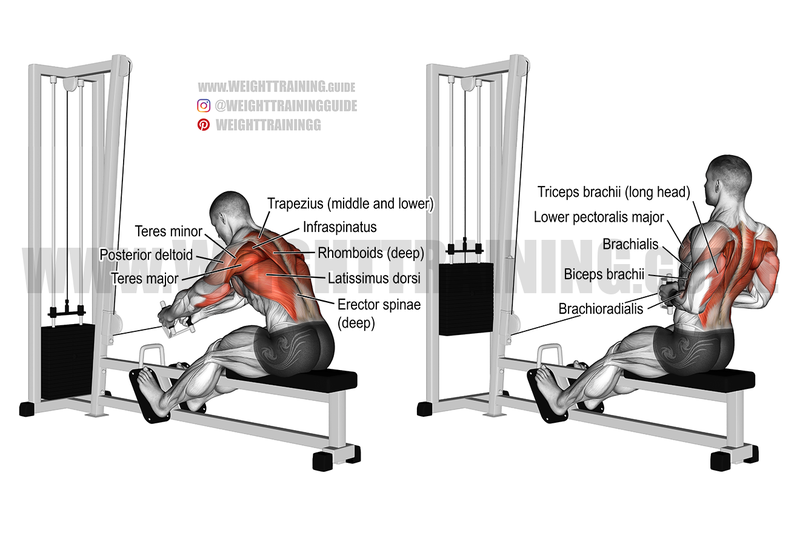 Most people will tell you to keep your back straight and your chest out throughout the seated cable row exercise. That’s known as the straight-back seated cable row. It’s a different exercise, which doesn’t dynamically work your erector spinae (spinal erectors). The exercise described above does dynamically work your spinal erectors. Luv this workout! Gives me upper body strength. I always do this with straight back. Didn’t realize there was a difference. If you don’t have a cable machine, what would be an effective alternative to this?